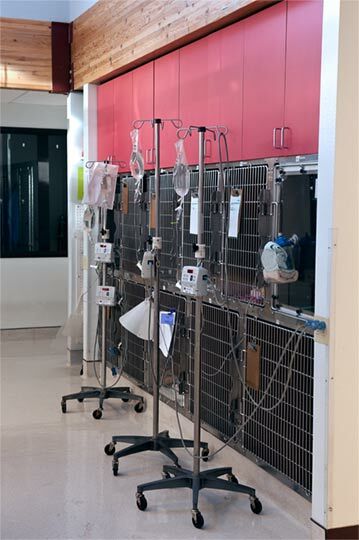 The intensive care cage bank is in the treatment area. Patients who are on intravenous fluids, recovering from anesthesia, seriously ill or in need of close monitoring are held in this area. 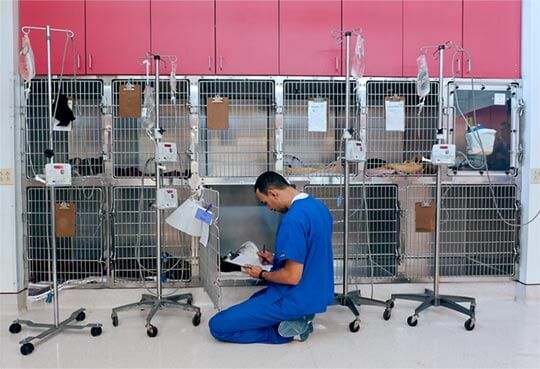 This allows for constant observation by the doctors and technicians and allows for rapid intervention when needed by the most critically ill cats and dogs. Note the intravenous fluid pumps which deliver a precise amount of fluid to these patients. We recommend that any patient that is critically ill and requires overnight care be transported to a 24-hr emergency care hospital in Albuquerque.